Eugene H. Krabs – From SpongePedia, the biggest SpongeBob-wiki in the world! Eugene Harold Krabs, better known as simply Mr. Krabs, is the penny-pinching owner and founder of the Krusty Krab, a fast food restaurant in Bikini Bottom. In his childhood, he formed a friendship with Sheldon J. Plankton which eventually turned into a bitter rivalry. He's the 4th main character of the show. Eugene lives with only Pearl, suggesting that he may be separated or divorced. It is more likely that Krabs is divorced, because he had a short relationship with Mrs. Puff in Krusty Love. Mrs. Puff was Mr. Krabs' love interest in Krusty Love. He also has a great love for money and on several occasions has been seen dating it. Clancy Brown - Mr. Krabs speaking voice. 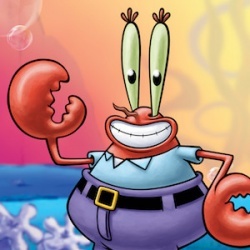 Dee Bradley Baker - Mr. Krabs singing voice. Joe Whyte - Video Games (Operation Krabby Patty, SuperSponge and Battle of Bikini Bottom). Sheldon J. Plankton, born on the same day as Krabs, was his best friend from birth. While at the carnival, Mr. Krabs was amazed at a penny he found, when Plankton told him all about money. In the episode "My Pretty Seahorse (Episode from Season 3)," Mr. Krabs told SpongeBob of a story about his father giving him a dollar at the age of five years old. He recalls that he loved that dollar; however, he spent it on a soda, one hot day at the beach. Because of his family's poverty, Krabs was teased at Poseidon Elementary School, where Plankton was his only friend. The only place to get a burger in Bikini Bottom was Stinky Burger, which was owned by a wealthy citizen, Stinky. Once, Krabs and Plankton wanted to get a burger there, but Stinky didn't like them hanging around his restaurant. After seeing Stinky's wealth, this inspired Krabs and Plankton to create their own burger. When they finally completed it, no one was around to buy it. Upon seeing Old Man Jenkins there, he was the first to try the Plabs Burger. However, the burger was contaminated and Jenkins passed out. This caused Plankton and Krabs to argue about the burger. Plankton attempted to steal the formula, which ripped in half. Plankton took their burger batch and decided to go into business alone. A shelf in their dump restaurant collapsed, which combined certain ingredients together to form a perfect burger batch. Both Plankton and Krabs attempted to sell their separate creations separately, where only Krabs succeeded. Since the recipe is said to be an old Krabs family recipe, Mr. Krabs' accidental recipe for a burger patty combined with his family's secret sauce. This lead Mr. Krabs to start a business which lead his family out of poverty. Mr. Krabs and his family lived in a pink house where Betsy Krabs, his mom, continues to live now. Mr. Krabs room is still filled with his old toys. 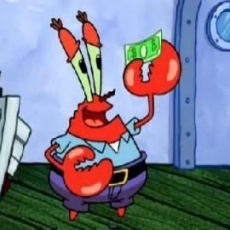 Eugene H. Krabs has always been a penny-pinching financial genius, and has always been obsessed with money. He once sold SpongeBob to the Flying Dutchman for 62 cents. He gives his employees a bill, instead of a paycheck, because they kept goofing off on the job, participating in activies such as breathing, standing, or tying ones shoe. He also attempted to retrieve a dollar, or the fragments of it, after it had been put through a blender. In Welcome to the Chum Bucket, he had a good singing voice. Mr. Krab's nose is also very sensitive and can smell up to anything that he detests. According to Hooky, he can smell 30,000 miles of laziness. Also, he has made the Krusty Krab's employee law that no one should take a break at the Krusty Krab up to 3 generations. Mr. Krabs also has no life insurance, car insurance, or hospital insurance as revealed in The Lost Mattress because he's a very, very greedy and cheap man who never likes to spend his money. He doesn't have a bank account either, but has a credit card from Master Carp. Mr. Krabs' career began after a war, when he was secluded in a deep depression that seemed endless. He bought a pirate ship and became a pirate, like his grandfather, but then sold his ship and bought a local bankrupt retirement home, "The Rusty Krab," which he decided to turn into a restaurant. He went into business selling his family's Krabby Patty burger. It was revealed to be a family secret in "Dunces and Dragons", and it was King Krabs who named the burger, back in the Middle Ages. In 2004, a chum famine wiped out all of the chum crops, causing Krabs to give no breaks to his employees. The Krusty Krab has come close to going out of business due to such rival restaurants as the aforementioned Chum Bucket, Pretty Patty stand, Krabby O'Mondays, and KelpShake, just to name a few. The building is also in serious disrepair, as its walls frequently ooze green slime, and it has seriously faulty electrical wiring. Mr. Krabs' idea of maintenance is to simply place giant bandages on cracks in the walls, which obviously is inadequate. Also, in one episode, only half of the Krusty Krab is lit and other is in the dark (Krab's reason was that he shouldn't need to light the entire "store"). An Olympics-type sporting event that was started about 1985, called The Fry Cook Games, runs every year. Krabs and Plankton compete in the games, in which Krabs hopes to glorify his restaurant. Mr. Krabs won gold one year for a challenge by lifting a pickles-dumbell, however lost to Plankton in the Onion-Ring Routine. In the Movie, Mr. Krabs opened The Krusty Krab 2, right next to the original burger stand, where Squidward is chosen to be the manager (much to SpongeBob's dismay)... that is until the end of the movie, where SpongeBob becomes its manager. Krabs sometimes identifies himself as a sailor, most likely because he did serve in the Navy at one point and he's from a pirate dynasty. The Navy was where he earned the tough manly nickname "Armor Abs Krabs". During his service, he was the chief janitor on the S.S. Gourmet and "head chef" on the S.S. Diarrhea. Sometimes when he appears onscreen, sailor's music is played; Krabs uses sea-faring vocabulary; he calls his staff his 'crew', and the disagreement as 'mutiny', while his laugh is also appropriate ('Ar 'ar 'ar 'ar 'ar'). That's maybe why he uses his dictionary at work (The Abrasive Side). In contrast to his namesake, Krabs is something of a miser; he is known to go insane if he has to give up so much as a penny. In "Born Again Krabs", he gave SpongeBob up to the Flying Dutchman for only sixty-two cents, but repented later. When customers leave the restaurant because they do not like the food (which is usually due to SpongeBob or Squidward's inaccuracies), he uses catchphrases - these include "That's me money walkin' out the door! ", or "There's gonna be a few changes around here!". However, he's a caring and thoughtful crab; he appreciates his employees, SpongeBob SquarePants and Squidward Tentacles (who help keep his restaurant afloat), dotes on his daughter, Pearl Krabs, with Spongebob's help, and in one episode, he found his second love (after money), Mrs. Puff (in "Krusty Love"). Mr. Krabs' arch-rival and somewhat friend is Sheldon J. Plankton, the owner of rival restaurant the Chum Bucket across the street from his establishment. He has a mother, Mama Krabs, who lives in a near identical version of his anchor home, except it is pink. His address was also revealed to be 3541 Anchor Way. Mr. Krabs tries to keep it cheap when purchasing anything, even though he's the richest crab in the ocean, which often results in Pearl becoming extremely disappointed in her gifts, such as used batteries, or the infamous Squeaky Boots. Mr. Krabs also owns a pet worm named "Mr. Doodles" as seen in the episodes As Seen On TV and Sandy's Rocket. It is also shown in the episode Mid-Life Crustacean that he can extend his arms to great distances to collect items. Even though he's a cheapskate he will not use anything but the best ingredients in his Krabby Patties and is against them being manufactured probably since the Secret Formula is his pride, and he realizes that if he uses cheap ingredients people will stop coming. Whenever Mr. Krabs - on every occasion - would take a customer's order, he never actually gets to finish it. This is due to the fact that he always is ordering for a robot (Plankton), a squeaking fish, etc. In Christmas Who?, Mr. Krabs had the ability to sing in a high girly voice similar to that of a 70's singer. He appeared the most in Season 4. Like SpongeBob, Patrick and Squidward, he is ambidextrous. Also, he has got a gold tooth. His last name is spelt like the pronunciation of crabs. He owns the Jellyfish Jam Making Factory. In the video game SpongeBob SquarePants: Lights, Camera, Pants!, in the Art Gallery section of the Extras menu, if the player has unlocked it, there will be a mock movie poster entitled "The Bat-Sponge of Bikini Bottom" (a parody of Batman and based on a short sequence in The Sponge Who Could Fly). In very fine print at the bottom of the poster, it lists "other stars". This includes an entry that reads "Eugene 'Gunner' Krabs". This could mean that Mr. Krabs' nickname is "Gunner". He possibly got this nickname during his military service. That one poster in Lights, Camera, Pants! is the only time the nickname has ever been used. It has been revealed in the Season 8 episode The Krabby Patty That Ate Bikini Bottom that Mr. Krabs has the ability to breathe fresh air, (shared with Sandy), unlike the other characters. Mr. Krabs pays SpongeBob Wacky Bucks. "That's me money walking out the door!" "Hello... may I take your money?" "Not a customer in sight. If I don't make any money today, I'll surely break out in a rash." "What? Three dollars down from last month? I GOTTA RUN A TIGHTER SHIP AROUND HERE!" "What's with all this change nonsense??" "What have you done with me restaurant?!?" "Counting me money. Money sweeter than honey. Money money this, money money that. Profit will make me wallet fat!" "There's gonna be some changes around here!" "Boys! You're spending me money!" Squidward: "I'm getting paid overtime for this, right Mr. Krabs?" This page was last modified on 8 March 2019, at 16:01. This page has been accessed 204,505 times.